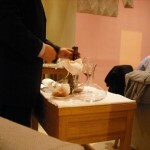 I was extremely disappointed with wine service in a couple of top restaurants on my last trip to Piemonte, Italy. Restaurants that have either earned a star in the Michelin Guide or consider themselves “wine-oriented”. 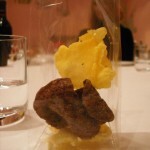 My first negative experience was in a 1 Michelin-stared restaurant in Alba, Ristorante Piazza Duomo – La Piola. When we arrived we were greeted promptly with an open door. As we moved upstairs, there were 2 or 3 people helping us with our jackets and to our table. 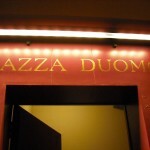 Once we were seated, the server showed up with an aperitif menu, not a wine list, which we promptly asked for. We were a group of 7 people, 6 of us were educated sommelier’s who work in the business. 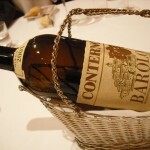 Among the bottles we selected for our dinner was a 2001 Giacomo Conterno Barolo Riserva Monfortino. The server was quick to confirm we had made a great selection and quickly pointed to a table of 12 behind us where the wine maker was actually seated! We thought this was a great start to a fantastic evening! 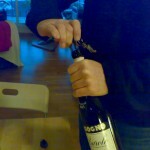 We ordered the rest of the wines for the evening and asked that the Monfortino be decanted right away. 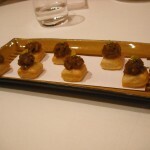 The amuse-bouche from the kitchen started to arrive, 6 dfferent ones in all! Everything seemed to be going well. 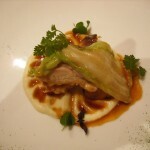 The problems started just before our first course arrived, a suckling pig with cauliflower. The 2006 Heymann-Löwenstein Riesling we ordered (unfortunately, there is an incredible lack of German Rieslings on wine lists in Italy) was opened a few meters away from us on a small work table that was wheeled over. 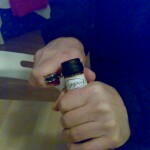 The server never showed us the bottle (label) to confirm our selection before proceeding to open it. After the bottle was opened, the server came over to our host , and poured some in his glass. 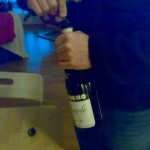 Our host had to make an effort and tilted his head to read the label to see if the correct wine was being poured. This was our first bad wine service experience of the evening. Needless to say, the wine was great and paired well with the suckling pig, which was also great. A full 20 minutes had now passed since we had ordered the wines and still the Monfortino had not been presented nor decanted as we had specifically asked. 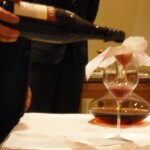 In fact, about an hour passed before our Monfortino was finally decanted; once again without presentation to confirm our selection. 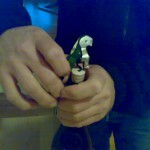 Once opened, our wine was tasted by the “sommelier”. 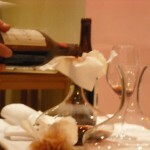 After being decanted, the decanter was brought over to a shelf on the other side of the restaurant where other bottles of wine were placed until they were served to the guests. The empty bottle was placed on our table for show. 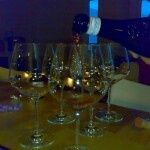 The sommelier didn’t give us the opportunity to taste the wine at this point as I felt he should have. 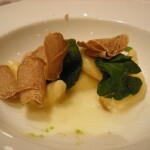 We had two bottles of wine with our next course, the cheese-filled gnocchi with the seasonal and at this point of our trip, mandatory white truffles grated on top. The two bottles selected for this course was a 1979 Roagna Barbaresco (we found this bottle standing and covered in dust in the cellar of the restaurant we had dinner at the night before, which we gladly paid €70 for) and a 2006 Giovanni Almondo Roero (100% nebbiolo ) as a backup just in case the Roagna was over the hill and tired. Here comes the next wine service disaster. After letting our host sample the first splash of the Roagna, which brought a big smile to his face suggesting that the Roagna was in surprisingly intact condition, the server then proceeded to pour the wine around the table for the rest of us. When the server got back to our host, she over poured this 30-year old wine into the glass along with the sediment, rendering his glass of wine almost undrinkable! This is a 1 Michelin-starred restaurant in the center of the most prestigious wine region in Italy, with one of the top Barolo producers sitting just behind us, and a sommelier who doesn’t know how to serve a 30-year old bottle of locally produced wine! Although this was the last chance they had to show us their incompetence, they continued to show their incompetence to the table behind us where Mr. Conterno was seated. As you might have guessed, that table was enjoying some rather old and rare Conterno wines dating back to a 1937 that appeared to be in impeccable condition! 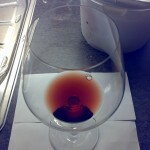 This wine along with a bottle of 1964 were obviously full of sediment, so the “sommelier” proceeded to decant the wines through an ordinary bleach-white paper towel from the kitchen (NOT a cheese cloth) to filter the wine! We looked in disbelief, as did Mr. Conterno himself! As we stared over, the sommelier looked over at me and in Italian said “This is what you have to do with the old wines!”. I have never seen a wine filtered thru ordinary bleach-white kitchen paper before! The paper worked so inadequately, that the wine had difficulty passing through and therefore wine was wasted as he placed the still soaking paper towel in a small dish to the side.. Please look at the photo’s I managed to snap so you can understand what we were all in disbelief over..
We were so taken aback by this that we completely forgot about the excellent food and the glass of 2001 Monfortino we had in front of us! What a shame because the food was truly great and deserving of its Michelin Star. The next night I had dinner alone at Ristorante Enoclub. The name suggested their expertise with wine. I enjoyed a glass of Dolcetto with the starter, a local veal tartare. Before finishing the starter I ordered a glass of the 2003 Josetta Saffirio Barolo to enjoy with the main course, roasted rabbit. The server cleared my starter once I finished and over the next 10-15 minutes two different servers told me that my glass of Barolo was on its way. The restaurant was about a third full, and there were 3 servers working. Each of which was quickly passing my table continuously with their hands empty. My main course of roasted rabbit was finally served. 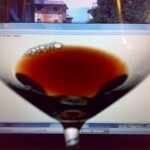 No glass of Barolo yet. I sat with my main course in front of me for no less than 10 minutes. I finally decided that I was going to stand up and leave. As I do, the server comes over immediately and says, your glass of wine is on its way! I told her it was too late as the rabbit had become cold. They said they would re-fire the rabbit. I told them that they needed to learn a bit about the service of wine, and politely asked for my bill for the first course and glass of wine so I could leave. They told me there was no need to pay if I was unsatisfied and so I walked out, unsatisfied. My attitude may seem a bit extreme to some of you out there, and it probably is. Nobody ever told me years ago when I started to study and work with wine, that I would become so picky about its service, that I would at times let it ruin my evening. Oh well, I still enjoy my wine experiences 95% of the time, so I will be grateful for that! Opened and NOT decanted. 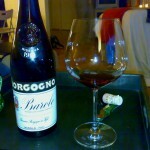 Poured into large Burgundy glasses. a little burn on the nostrils from the alcohol. 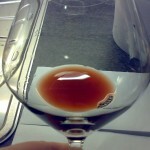 15-30 minutes after the bottle was opened, the wine started really opening up – fruit was more intense on the nose and on the palate. 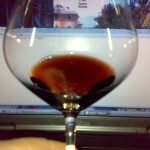 Acidity more pronounced and tannins a bit softer, but still quite firm. The wine remained well-balance throughout. 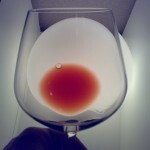 A typical aged nebbiolo with classic nebbiolo nose and palate with well defined and firm tannins. Well made, good concentration and balance, but not very complex. 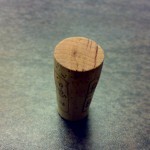 I believe that this bottle still hade some life ahead of it – enjoy now or for another 5-10 years. 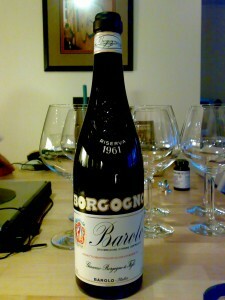 Although it’s always interesting to taste a mature wine, this wine didn’t leave me desiring more..